I remember a time long ago when I wasn't that fond of the color yellow. It was all because of yellow Starburst, really. I just never was a fan of that lemony flavor, and my perception of the color was seriously damaged because of it. The only color I hated worse than yellow was orange (because the only Starburst flavor worse than lemon was orange in my opinion), and pink was my all-time favorite color. 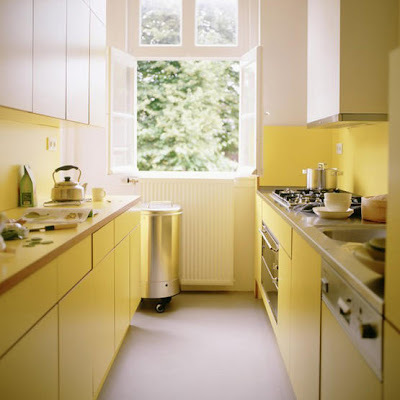 Now that I'm older, wiser, and don't connect my colors with what goes in my stomach, yellow has redeemed itself in my eyes--in fact, it's my second-favorite color. 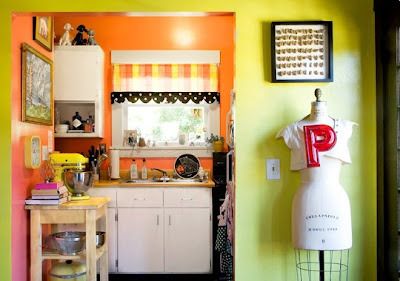 However, for some reason I'd never even considered using that color for decorating... until a conversation Chris and I had over Kitchenaid mixers. Whoa yellow! Either someone's been messing with this photo (which actually they probably have, come to think about it--even the white looks yellow), or this is a bit too much yellow, even for me. It is a very happy kitchen, though, and I like the warm brown they chose as a second color, and the brick wall behind the stove. It's hard to tell, but it looks like it might be a light green in natural light, which would make it a nice focal point and a good color addition. 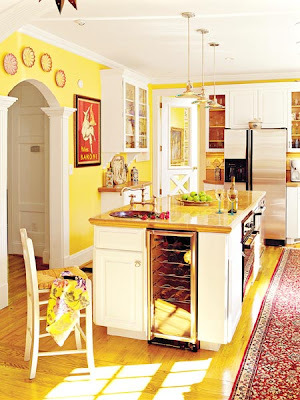 I love the butter yellow on these walls! The way it's been balanced with the white and the red makes it not too overwhelming, and the rug adds some nice color to the floor. Sigh, this tiny kitchen reminds me all too much of the kitchen I endured all last semester (and the one I'm going back to), only I had to keep mine white. The yellow does brighten it up, though, and in my mind I'm picturing pretty pastel decorations of the sort that one might find in A Field Journal. In my humble opinion, a little pink and blue could go a long way in "cutening" this little kitchen. 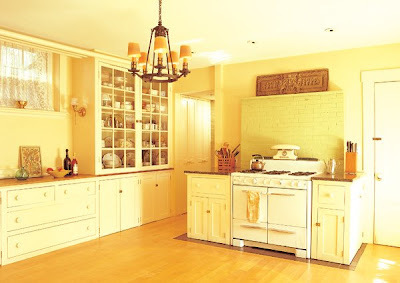 Nope, this is not a yellow kitchen. There's yellow in it, though, and I just love its pure funky awesomeness (does that wall really blend from orange to pink?). And look! A yellow mixer! This last kitchen was one of my favorites. 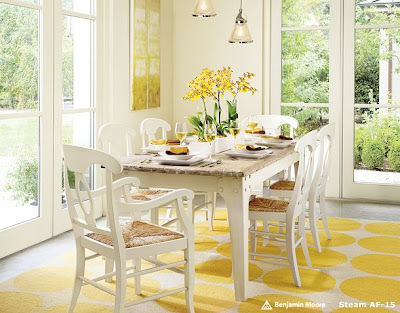 The walls are white, but the large windows and the bright yellow polka dots on the rug makes it seem colorful anyway. The artwork on the wall and the flowers on the table further tie in the color as a theme, and everything just ties together to make it look fresh and natural. 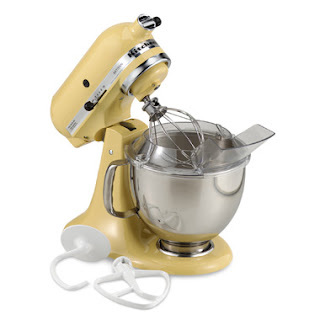 So after all that, I'm not entirely sure that we're going with the yellow mixer anymore. The reason? This. But that's okay, because I'm now picturing a yellow kitchen with turquoise tie-ins. Ha ha, what am I going to do with myself? I can't have turquoise in every room... can I? 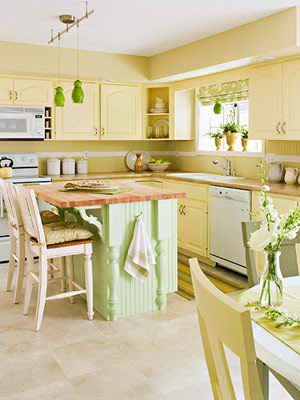 Oh, I adore the yellow and green kitchen. 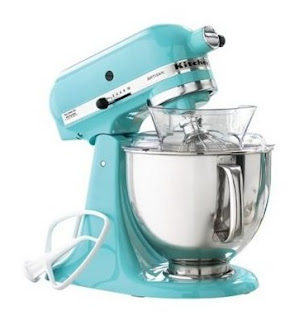 And the turquoise mixer matches your blog so well, but I think it would go equally as well with yellow! You can always practice decorating my house until you get your own!! I loved them all! Chris's Grandma had the yellow kitchen, not me. But you have me almost convinced, but what do I do with my blue wallpaper??? OK I'll take the blue mixer then!